Lara Jean and her boyfriend Peter are in their last year in high school. Lara Jean is hoping that she’ll get into UVA. As she’ll be with Peter but also remain with her family while she’s at college. Her father’s relationship with Ms. Rothschild is going well. In fact Ms. Rothschild has become apart of the family. Lara Jean is preparing for her classes trip to New York City, college, and the inevitable good-byes to her teachers and classmates. Unfortunately not everything goes according to Lara Jean’s plan. Throughout this book Lara Jean has to decide what she wants in life and how will she and Peter navigate their relationship. When I heard that this book would be released I was overjoyed! This is my favourite contemporary series! I am glad to say that it was wonderful! Just like the previous books it is written in first person all in Lara Jean’s point of view. And there are chapter numbers. There are text messages, admission emails, and a letter of sorts at the end of this book. I loved everything about this book! From the trip to New York City, the wedding, as well as Lara Jean and Chris’s spontaneous road trip to North Carolina. I especially love that in every book Lara Jean develops. There’s no reset button just growth. Like the previous books there is such a large emphasis on family. Margot, Kitty, their father, and Lara Jean are a very close knit family. Ms. Rothschild and Peter are additions to their family. Partway in the book their father proposes to Ms. Rothschild with Lara Jean, Kitty, and Peter’s help. Margot doesn’t quite like that Ms. Rothschild has such a huge role in their family. As she was in university for most of this book, Margot gets the shock when she sees how close her father is to Ms. Rothschild. For the majority of the book Margot has a very strained relationship with Ms. Rothschild. Margot doesn’t have a problem with Ms. Rothschild as a person, just that she didn’t expect her father to ever get married. Despite this Margot remains supportive of her father and his decisions. The two do make-up and it was beautiful! Applying for college was a huge part of this book. All of Peter and Lara Jean’s friends are going their separate ways. The seniors all plan to have one last get-together before that happens. They have the trip to New York City, seniors week, and some plans after graduation. It was so much fun to read about, but also had a bittersweet feel to it. Kind of reminds me of my high school days. As foreshadowed in the synopsis Lara Jean doesn’t get accepted in UVA. This obviously puts a strain on her relationship with Peter. The two come up with another plan instead. They plan to spend their first year apart but in their second year Lara Jean will transfer to UVA. Peter’s family is actually a huge part of this book. His father actually make’s an appearance and it attempting to get back into Peter’s life and good graces. Due to his insecurities with his father Peter felt that Lara Jean would dump him Further proven to him when Lara Jean made a scrapbook so that he could take it to him in UVA. Peter thought that this was Lara Jean’s way of saying good-bye. The two make-up (of course) and decide to face any obstacles that come in the future together. I was actually happy that Peter’s family life came in. And that this time it was his insecurities that drove them apart rather than his relationship with Genevieve. It has been heavily implied that Peter has many insecurities. And I have always assumed that his parent’s divorce had more of an effect on him than he implied. I felt that it was done well. Lara Jean is really upset that she didn’t make it into UVA. She won’t get to be with her family nor will she be in school with Peter. Once Peter lays out the new plan to Lara Jean she has a purpose. Though she is very depressed and instead of meeting with her future peers (one of the those college freshmen get-together’s) Lara Jean puts all her energy into planning the wedding. Surprisingly Lara Jean gets accepted into UNC. When Lara Jean tells Chris, she (Chris) tells Lara Jean that they should go a on spontaneous road trip to North Carolina. The road trip was a blast to read about! Chris and Lara Jean saw UNC (which was beautifully described), they meet new people, ate new food, and just had fun. Of course when the two arrive home they get into trouble. Lara Jean’s family is overjoyed that she got into UNC. Her family urge her to choose what she wants and that they’ll always support her. Now I know that there were some people that weren’t happy when this book was announced. But I personally felt that this book was necessary. 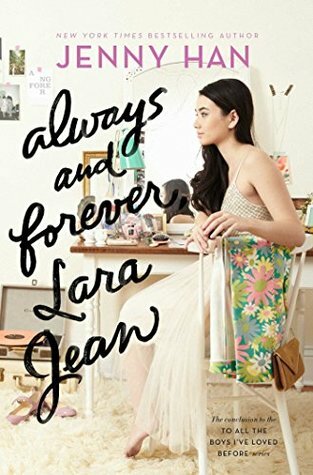 Unlike P. S. I Still Love You, Always and Forever Lara Jean felt like a conclusion book. Lara Jean has a last hora with Chris (I like to imagine that they’ll still keep up in the future), has last conversations with Lucas, John, Genevieve, and Stormy (who sadly passed away in this book), and her father gets remarried (the wedding planning and the wedding itself was awesome). Even the drama was realistic and well done. Overall Always and Forever Lara Jean was a beautiful conclusion to the series. I recommend this series to everyone. i was so pleasantly surprised by this book!! !